We have had THREE sunny days in a row!!! How cool is that?? I LOVE the sunshine and warmth it brings and after a dreary winter, I couldn’t be more thrilled about the sunshine!! I spent one of those bright sunny days working in my front flower bed…clearing out the abundance of weeds that managed to overtake it at the end of last growing season and the beginning of this one. I love working in my yard for the beauty that it brings to my curb appeal but there is also something so satisfying about a hard day’s work. It’s so fulfilling! Anywhoo, a week ago on Facebook, I told you about the ‪#‎polarpixsweepstakes where you can enter to win Free Polar Pops for a year… you can read all about it HERE. WELLLLL, Circle K is making this deal a little sweeter and letting me give away a $50 Circle K gift card to my readers!!! How fun is that?? Enter the $50 Circle K gift card giveaway by leaving me a comment at the end of this post telling me about your favorite summer memory. Make sure you leave a valid e-mail address so I can contact you if you win. That’s it!! 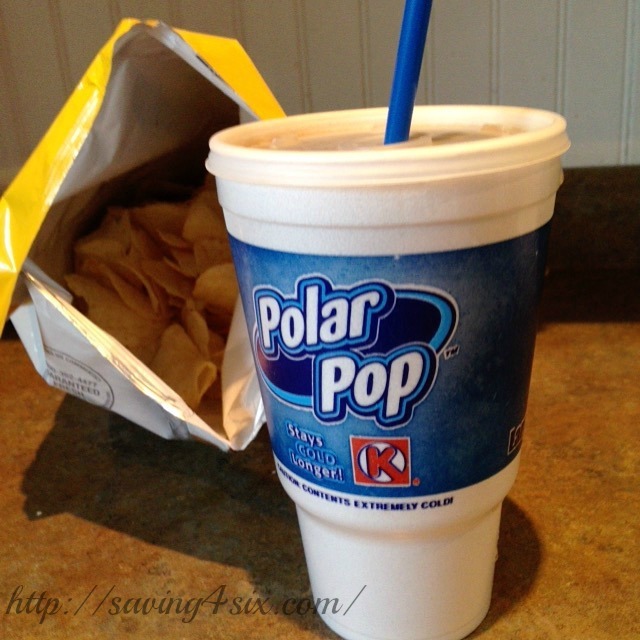 SOOO, comment below for a chance to win the $50 Circle K gift card and then check out #polarpixsweepstakes for a chance to win Free Polar Pops for a year! My favorite summer memory is staying with my Aunt & my brothers in the summers, growing up in North Carolina..We went to Carowinds Amusement Park & had a blast! Favorite summer memory… how about just summer in general is my favorite? 😀 We are looking forward to making some fun memories at the zoo, pool, etc this summer with the boys! My best summer memories were our family trips to Tomahawk, Wisconsin every summer when I was young. My dad and brother would go fishing (sometimes me, too). Most of my time was spent hiking and exploring the woods around the cabin we rented. My sister worked on her tan and flirted with cute guys, and my mom just relaxed. My very best memories were when we’d go to a riding stable about a mile or two away – I have always loved horses and could have spent every waking moment there. I miss those days so much. I remember playing outside until about 9:00 at night with my sister and brother. I would be absolutely filthy. Thank you for the giveaway. My favorite summer memory is spending the night at my Grandma’s so we could stay outside past sunset and catch lightning bugs and put them in mason jars. Then using them as night lights. My favorite summer memory is our family trips to the Smokey Mountains with my parents and all my siblings! My favorite summer memories are summers at grandmas and making muscadine jelly and ice cream. My favorite summer memory is when we took my kids to the beach for the first time. My favorite summer memory was going every summer to the beach for a week with lots of family. My favorite summer memory was visiting my grandparents every summer. My cousin and I would stay the night with my grandparents and my grandmpa, cousin and I would stay up late and watch Grease. My grandpa would always give us a pop quiz over the movie even though we had seen it a hundred times. My favorite summer memory is getting up before dawn to go fishing with my dad. My favorite Summer memories would be hangin out until the street lights came on in my neighborhood as a kid catching lightening bugs! Memories…..
My favorite summer memory was when I was pregnant with my twins walking around with a tummy so big I couldn’t see my feet! I honestly loved the attention I was getting in my PREGO SWIMSUIT! Early summer mornings on the beach in Destin Florids, hunting for seashells as the sun rose. My favorite summer memory is when my Dad would take us to Disney World in the summers when my brother and I were young. Playing in the sprinkler in the back yard and eating popsicles. my favorite summer memory growing up was attending Vacation Bible school. Also, my church had a sleepaway camp for a week. We went out of town and had a lot of fun and fellowship. My favorite summer memory is our tradition of buying the first watermelon of the summer as soon as school was out for the summer! This activity was the kick-off to summer fun! My Favorite Summer memory is going to my Aunt and Uncles house and fishing and swimming off there dock! My favorite summer memories are always the week we spend with the family in Ocean City, MD! My two children- who each bring a friend- and my hubby & his sister, her hubby & our niece all rent a townhouse and have a blast all week! My favorite summer memories are all about long lazy days and barbecuing with my family out under our old oak tree. Bliss! My favorite summer memory was actually last year at the beach. We rode jet skis for the first time with my grandsons and had a blast! We had so much fun together and even saw some dolphins! Can’t wait to create more memories like this! My favorite summer memory is one of our family trips to New England. A fun road trip…no itinerary, just exploring! Swimming in the Mediterranean Sea with my family on vacation! My favorite summer memory is when my parents allowed us to eat watermelon for dinner in the backyard and we would have watermelon seed spitting contests and eat until we were so full. My favorite summer memory was going to the beach with my mom and two brothers. My mom always brought hot dogs wrapped in tin foil. It was something about the sun and tin foil that made those hot dogs so good. I will never forget that! My favorite summer memory is taking a San Diego trip last year with the entire family. Sun, fun, and family… It was perfect! My favorite Summer memory was sending time at my Grandma’s trailer at Diamond lake with all my family members. My favorite summer memory was walking to the gas station to get drinks. They used to have a little tray of cherries, limes and lemons that we could garnish them with. The BEST! My favorite summer memory is the first time my husband and I took our three boys camping. We went to a lake. The weather was beautiful, and the boys had a blast “exploring”. We all had an amazing time! My favorite summer memory is my boys’ first Disney visit. The look on their faces at seeing Buzz and Woody was priceless! My favorite summer memory is swimming. Growing up in the deep south, summers were hot. We swam in pools, ponds. lakes, bayous, and the Gulf of Mexico. Sometimes we camped out. My favorite summer memory was comes from the time I spent with my grandparents at lake house they owned. Every summer we would go there for a week and spend time together as a family. All of the family was there. I recall many late evenings hanging out reminiscing about the old days. It was there I caught my first fish. My grandparents have since passed but the memories are forever there. My favorite summer memory is going to my grandparents house to spend time with my cousins. Long beautiful days, spent outside on the farm, with all kinds of good food and snacks, and TV in the evening. What a treat! My favorite summer memory is working the summer before I started college. I was very shy and knew that I had a choice..continue being shy or step out of myself. So I turned to the guy working next to me and started talking! Changed my life forever. My favorite summer memory would have to be last year it was my daughter’s first summer and we took her swimming and she just splashed and splashed in the water! My favorite summer memory was when we traveled from Michigan to Tennessee, and I got to meet my grand parents for the first time! My favorite memory was when I went to Disneyland for 8th grade graduation it was very fun. swimming in our pool with my sister. Winning a tennis tournament that had a week stay at an Island home down south..Been going every since that summer weekend 40 years ago..
My favorite summer memory is July 4th, 1976. My favorite summer memory is when we took our daughter to the Smoky Mountains. I don’t really have a favorite. However my daughters birthday is in December so this year we are having a pool party for her. So this will be my new favorite memory. My favorite summer memory is a road trip that I took with friends to Canada! My favorite was going to Florida with my entire family years back! My favorite was when I went camping with my boyfriend and his parents up in the mountains for the first time.I had so much fun I hope we go again! My favorite summer memory was visiting Disney World when I was a child. It was the best vacation ever. My favorite summer memory is when our kids were little — — I loved spending the days with the swimming and playing in the pool, having a BBQ and ending the night with a bon fire and S’mores. I used to go fishing in the summer with my grandpa. We would stop at the gas station convenience store to buy gummy worms and soda. My favorite summer memory is taking a road trip with my family! We’d get a couple of chances to run in to the gas station and pick up soda & candy! My favorite summer memory is going to a carnival for 4th of July and then watching fireworks at the park.